The Samsung Galaxy Note 10.1 tablet launched with Android 4.0 Ice Cream Sandwich (unlike its smaller Note II sibling), but its Jelly Bean update has now started its rollout. It's the 4.1 version of Jelly Bean and not 4.2, but the differences between the two aren't major anyway. The rollout is rather limited as of now - just in Germany as an OTA update that weighs in at 300MB. The guys from AllAboutSamsung.de, who have already installed the update, report that it improves performance, adds the same S Pen functionality as the Note II has (e.g. the new Quick commands), adds Pop Up Play and new Mini Apps. Paper Artist is also pre-installed. 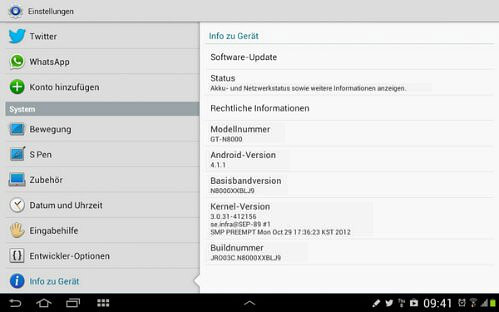 If you don't live in Germany and you just can’t wait to try out Jelly Bean on your Galaxy Note 10.1, you can grab the ROM from SamFirmware. The update brings the S Pen-enabled tablet to Android version 4.1.1 (PDA N8000XXBLJ9, CSC N8000OXABLJ9). Keep in mind that flashing the ROM manually will void your warranty and you might brick your tablet, so proceed at your own risk.